A new year means new opportunities. And I’m excited to see what Redmond has in store for us in 2019. 2018 in the Azure, Microsoft 365, and Office 365 arena was a foundation-building step toward the future; I think today we’re on the precipice of a new paradigm of the buzz-phrasy “modern workplace”. That’s why I’m so excited about the upcoming year or two. We’ve had so many new tools, consolidations, and feature expansions in 2017 and 2018; 2019 is the year where we’ll see how best to use them, with success story after success story built on the Microsoft Cloud. 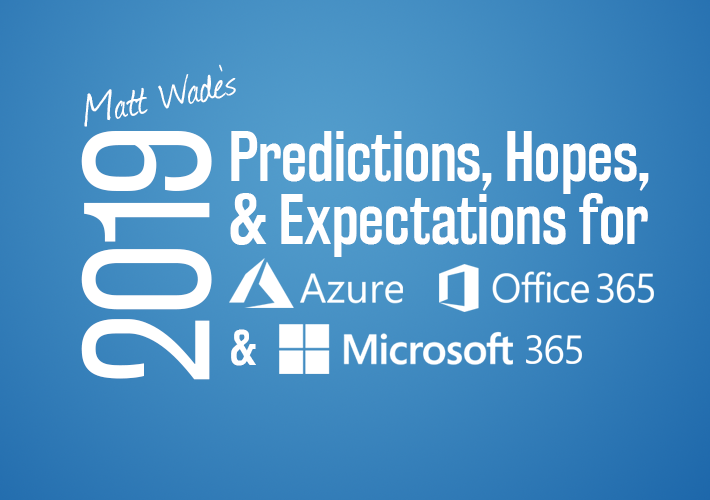 In that vein, below is a collection of things I either expect, predict, or hope to see sometime this year, spanning from IT Pro-level Azure administration to everyday-user impacts in Office Online. I’m a realist: there are lots of positive things in here, but there are also some below-par things to consider. I like to speak truth to my audience, and this post is no exception. I’m interested in what you think. If you have comments, suggestions, critiques, you name it, then post them at the end of this article. I’d love to see how everyone debates these topics. Have you seen the new icons for the base Office apps, plus OneDrive, Teams, and Yammer? Of course you have: it was everywhere a few weeks ago. This update represents a slick improvement to the Office 365 brand. While they’re not officially released yet, you’ll see folks in the community using them. (They may have gotten them from my recent post, actually.) Plus, stickers are out already. I’m interested in seeing what’s done with the rest of the ecosystem, not to mention “Office 365” at the meta level. Not completing the entire ecosystem could be a major whack at the coherence of the whole Office 365 brand, I expect, so hopefully we’ll see the rest of the icons updated soon. And, before you ask, we’ll update the icons in the Periodic Table of Office 365 once they update in the web UI. Then, and only then. Anecdotal and statistical data shows lots of moves from GSuite to Office 365. I think this trend will continue as many of the organizations (especially governments) jumped on “free” Google Apps a number of years ago. While free at the time, that move came with cost implications on the distant horizon that lots of sysadmins said, “that’s the next person’s problem”. Microsoft is finally competing with things like free education licensing, reduced government licensing, and free access to tools like Office Online and Teams. It’s a welcome change and one that will grow Microsoft’s share of the pie in 2019 methinks. Video is going to explode in 2019 with the major expansion of Microsoft Stream and many of its impressive AI-fueled features; add to this, Teams is (rightly) pushing video as an implicitly recommended default in conferencing. Video conferencing in Teams. Blurred background was recently rolled out, too. Meeting recording and auto-transcription will increase access to knowledge and decision-making, though it’s going to bloat our search results too. Updates to search governance is a must in a world of AI-powered content “creation”. I’m also hopeful there will be a formal retirement for Office 365 Video, which has hung on for a year longer than advertised. (I retired it from the Periodic Table on schedule and no, I won’t be reconsidering that decision.) Two video tools on the same Waffle just adds to the “Which Tool When” confusion. Here’s how to plan for the transition, if you need to. With additional applications and services coming out of Redmond at a dizzying pace, it means more options for customers to pick and choose as they migrate to the cloud. That means ever-longer license listings and mind-bendingly complex comparison matrices. Then there are existing tools. There will be a good amount of hullabaloo regarding the upcoming changes to Microsoft Flow licensing, namely the impacts of placing the HTTP connector behind the P1/P2 license plan. (Seems like a small change; for many organizations, it’s a huge one.) Take note that comments were disabled on the latter-linked blog post. There’s a reason for that. Licensing may be what hits the hardest and most noticeably, but it’s only a symptom. The diagnosis —in my opinion, at least — is the vast silos at Microsoft. For example, there are strong barriers between the Power Platform and Office teams (literally different org charts internally at Microsoft and different kitties for revenue intake). The way you experience them on a day-to-day basis makes that apparent, from the Power Platform doing as it pleases with the Waffle to the existence of two different user forum platforms (TechCommunity versus PowerUsers communities). They also don’t share revenue; the Flow licensing change is simply a result of this. New applications, expanded services, and splitting up teams lead to new silos. I’m not saying this is a hope; I’m no masochist. But it won’t hurt my profession either. Confusion in the ecosystem means job security, I guess. One of my biggest gripes has been and likely will remain the level of transparency and the consistency in the communications coming from Redmond. It’s so difficult to keep up with the number of communication spots, the amount of updates that come out, and the rate at which they hit us that I had to put together an infographic just to organize the sources clearly — not even the content, simply the sources! I would love to see a more centralized communication pathway, with a single spot for publishing all blogs posts, road maps, service outages, feature updates, etc. I don’t know if we’ll get much in this arena — see siloing discussion above — but one can dream. Unpopular opinion: I like Office Online. Office Online consists of the browser versions of Word, PowerPoint, Excel, and OneNote (some may say Outlook, too; I generally don’t given its very separate OWA history). It’s also the default experience you get when opening Office files in Microsoft Teams, SharePoint, and OneDrive. But I also know the right times to use these apps. Simple wording updates in a .docx meeting agenda, or changing around a standard formala in a budgeting spreadsheet? Why wait for the desktop app to open? The Online app will do just fine. But I also know that I’m not using Word Online to do any sort of image manipulation or PowerPoint Online to present a slideshow if I have complex animations or transitions. Better than it’s given credit for. In my experience, Office Online leaves a bad taste in new users’ mouths. They’re so used to the desktop application experience that anything less than that is totally unusable. (So someone told me, once.) Many even point out how good Google Apps is in the browser. Then again, many organizations still don’t know the difference between .docx and .doc so they couldn’t possibly understand the complex differences between Google Apps and Office Online, but that’s a different story altogether. This is likely the most popular button in Word Online. I just don’t have the metrics to prove it. I realize Google had the benefit of building competitors to Office years after Microsoft had to learn many lessons along the way. And I know that Microsoft is playing catch-up to Google in browser-based office apps. And that Google only has the one version of its apps to maintain (ignoring mobile apps). So I give Microsoft the benefit of doubt there. But 2019 needs to be the year of Office Online. Kick into high gear and give us the tools we use regularly; and make sure they’re fully featured. Microsoft has metrics on how often people use which features, and they need to prioritize the high-value ones and get them rolled out. Soon. Case in point: Track Changes is one of the most useful features of Microsoft Word. And while, yes, you can enable Track Changes in the desktop app and record changes in Word Online, you cannot toggle Track Changes nor see the changes that occurred when you’re in the browser. That’s a major hole in the feature set and one of the main reasons I see people walk away from Word Online and, consequently, Office Online as a whole. I mean, it’s not like I’m asking for Mail Merge in Word Online or a browser version of Publisher here, people. I need this in my [Word Online] life. I’m hoping 2019 will give people a reason to stop asking. If not just for my sanity. Until then, here’s some guidance on how to work with Office Online. 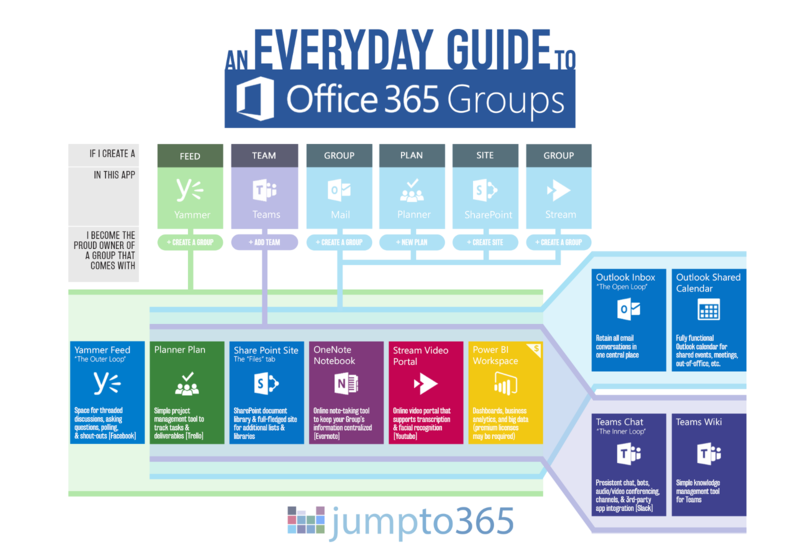 I’m a huge fan of Office 365 Groups. I speak regularly at conferences professing the amazing improvements in collaboration that come about due to Outlook, Yammer, and Teams thanks to this membership-service-that-literally-no-everyday-user-thinks-of-as-a-membership-service. That said, the segregation of the different types of Groups is still causing a lot of confusion among users and just blowing up the “Which Tool When” scene. There’s a reason I had to put this together: Groups are confusing right now! It shouldn’t matter which app you use to create a Group. It’s time to finally merge all the Group types into one. You want a Group? Great. Just create it. In any of the workloads that support Groups. And you’ll get all the workloads. Plus, a central group management center — a Group Hub, perhaps? — would be very helpful. In a better tomorrow, you choose the communication method that works for you. Right now, you’re kind of stuck with the one you choose. Actually, you’re more “stuck” with your choice now than you were a year ago. It used to be that if you create a Team, you see the underlying Group surface in Outlook too (since juggling them can make lots of sense). No more. While you can resurface the Team-created Group in Outlook using PowerShell, that doesn’t help the everyday user. And of course, there’s no jumping from Yammer to Teams or Outlook if you decide Yammer doesn’t do it for you. What I’m looking for here is a Group that creates all the workloads — Yammer, Teams, Planner, Outlook, SharePoint, Stream, Power BI, etc — and you get to choose what you want to use and you won’t be punished for picking “the wrong thing” at the beginning. Don’t like Teams after a month of using it? Jump to Yammer without losing your files or your tasks. Really liking Teams, but miss the shared calendar? We gotchu, fam. For years, Microsoft reps have regularly stated in conference sessions and blog posts that “Groups are Groups are Groups” but that’s definitely not true. 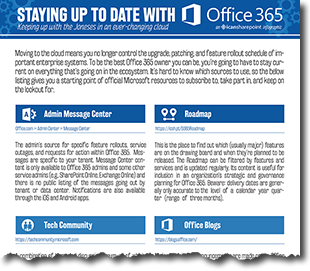 Only when a streamlined Office 365 Group service rolls out as defined above will that actually be real. And I really hope that comes this year. The SharePoint Team is rolling out a lot of great updates, improvements, and teasers for what’s to come. I predict we’ll end up with a battle between SharePoint purists and the “Other App-ers” in the coming years, given how much of the SharePoint experience is effectively being ported into all the Group-enabled apps like Teams, Outlook, Yammer, Planner, and the like. The success of the rest of the Office 365 ecosystem is actually taking away some of the need for pure SharePoint; not to say that the experience is a zero-sum game, but the piece of the pie that truly-SharePoint work is taking up in any given day of my life sure is smaller now. And with the rollout of metadata and the SP library tab in Teams soon, I may never go to SharePoint again! Just kidding, I still need to sync libraries; plus, search in Teams is whack when I really need to find files. 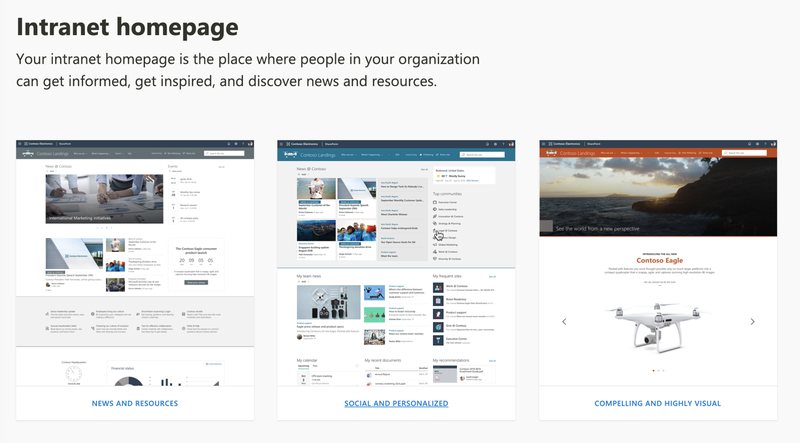 SharePoint Hub Sites are the new big thing to wrangle together all those flat Modern Sites you weren’t able to connect for the last few years, and that’s a good thing. My favorite aspect of Hub Sites? THE MEGAMENU! We’ve needed a true global menu feature in SharePoint since… well, since SharePoint got its name. And we’ve finally got it. It’s a major improvement and is going to untie a lot of knots that have been caught in intranet managers’ stomachs for the last fifteen years. Megamenus are my bag, baby. I’m super impressed with the SharePoint Look Book— though, again, we’ve needed this for literally the last decade. The Look Book gives you a bunch of different examples of what SharePoint sites in the modern era can look like, and they are feature-rich, beautiful, and should finally make intranet managers tingle with some SharePoint love. I’ve been preaching for years that people shouldn’t have to reinvent the wheel when they’re designing their sites, pages, and information architectures. Real-world users of SharePoint don’t want a blank canvas and every color of paint available. They want a paint-by-number with clear guidance that gets them a usable, pretty, “doesn’t look too much like SharePoint” deliverable. The Look Book is surely an improvement in that direction. Microsoft, please provide look books for other tools like PowerApps, Power BI, and even Teams. That’s not to say I’m closed-minded. I can’t wait to see real-world use cases where Spaces has been put into play, with successful and measurable improvements to organizational goals. I’m just worried that this shiny, expensive (in time and effort to create and maintain), new object that, personally, I think has a high chance of fizzling, was a wasted effort when there are plenty of other foundational things about SharePoint that could have been improved, streamlined, or outright fixed. Redmond, please prove me wrong. A Look Book for Spaces could help. Maybe the fact that I brought this up will expose it to more people who might do amazing things with it. Here’s a preview below. Teams is my favorite app in the Office 365 ecosystem. I talk about it a lot. I use it a lot. I preach it a lot. Sorry for being repetitive. Here are some of my thoughts on the year 2019 in Microsoft Teams. The holy grail of what the Teams product group can give me this year is the real, seamless ability to jump between tenants as a guest and even across accounts. That means showing me all my Teams in one place, regardless of the account or the (guest) status of an account. Take a look at how Outlook on iOS deals with multiple email addresses; I want that. Something along these lines is coming, though we’re not entirely sure quite what yet. I held a strong negative opinion of this missing feature, especially since many Slack users would hit me with a “nah-nah, we have this.” I started using Slack recently (not much, but a little bit) and it turns out it doesn’t really have it either. So I guess I can’t be too disappointed in Microsoft. Yes I can. But I won’t. I know they’re working on it. We get it: you want private Channels. They’re coming. I hate them because they’ll just inject significant levels of complexity in a tool that’s meant to keep things simple and easy to get around. Need separate permissions for a Channel? Create another Team. The sprawl is worth the security assurance. That’s all I’ll say about that. Even though Teams is a meeting and conferencing tool as much — maybe even more so — than Outlook ever was, the calendar is pretty weak. I have to jump back to Outlook frequently to deal with appointment updates, checking shared calendars, or simply getting a week or month view. Then there’s the whole concept of the Outlook Group calendar, which is completely missing from Teams. I’m hoping these are coming this year because I’d love to kick Outlook to the curb as soon as possible. Did you know you can host or join a Teams video conference right in Microsoft Edge? Do you use Edge? Of course you don’t. No one does. It’s time for Teams to provide video support in the rest of the browser family so anyone invited to a Teams video call — regardless of whether they’re on Office 365 or have the app downloaded — can access it immediately upon clicking the Join Teams Meeting link. Just this little thing will make a major impact on usability of Teams being hugely better than competitors like WebEx, GoToMeeting, and even Skype. Why? Because if you don’t use those apps and you want to video-call, you have to download the app or a plugin for your browser! If Teams is one of the first to get around this, it’s a boon for the app. Upvote this request now to get this to us in 2019. I know there are lots of dedicated Linux users out there. I realize they love their OS or need to use their OS — I went to engineering school and minored in computer science, so I know its pervasiveness in the technology industry — but I just can’t justify the demand for a Linux client for Teams right now. Teams has come a long way since its surprise birth in 2016, but has a long way to go before it’s got all the features we’d expect after decades of having email and video conferencing at our fingertips, ever improving every couple years. And that’s why I strongly oppose the [popular] UserVoice request for a Linux client. Give it a few years: we have big needs in the everyday user realm, leveling up with Outlook, Skype, and others. For once, let’s put them first. It’s the priority for adoption and building market share. Being a young application, Teams still has a lot of potential and some base features that aren’t really full-fledged yet. Especially when it comes to the Skype-to-Teams replacement. Many folks have pointed out that Microsoft’s claim that Teams reached feature parity with Skype simply wasn’t true (read the comments in that link). I’m hopeful that 2019 isn’t just the year of explosive Teams usage growth, but also feature growth. And as you take the dive into Teams, keep in mind the etiquette in this new experience isn’t something you’re born with. I put together a useful guide for new and veteran Teams users alike to guide them in how to best use the app while respecting their colleagues. It’s called the Definitive Guide to Everyday Etiquette in Microsoft Teams. Use it to help yourself and your colleagues be good neighbors in this new workspace. Add it as a tab in General Channels everywhere! I’m really excited to see where Azure Cognitive Services go in 2019. There’s so much potential already there and I look forward to both feature improvements and exciting use cases. 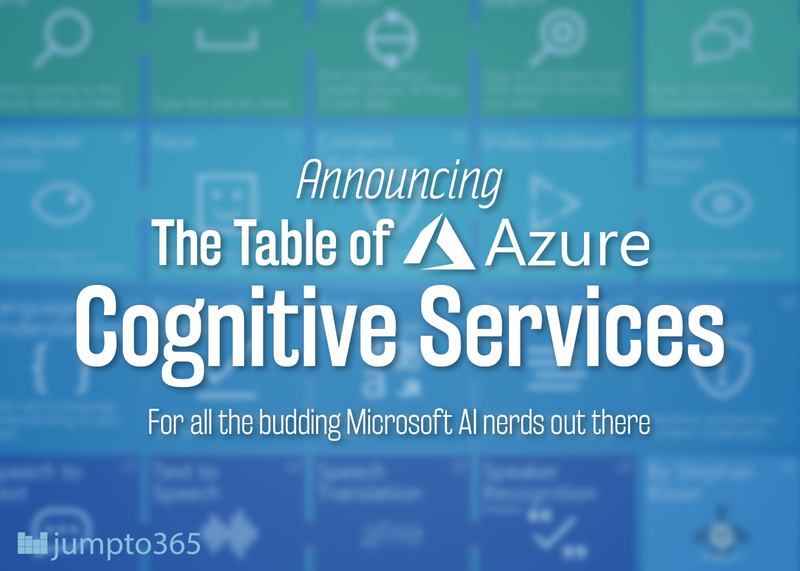 If you’re not familiar with Azure’s Cognitive Services, check out Stephan Bisser’s new Table of Azure Cog Services for an overview of what’s available and what they do. Click above for access. Trust me, you really want to. I’m really looking forward to expanded optical character recognition and other vision services. If we could get auto-OCR for documents based on machine-learned or designated designs, it could mean major improvements in document management. For example, receipts have a standard collection of information on them, but right now there’s no automatic way for Azure to analyze them to parse the costs, items purchased, date, or establishment. Other third-party services provide this for a hefty price. But if there’s one thing Microsoft’s great at lately, it’s taking competing products as inspiration and offering cheap alternatives on Azure (or, you know, buying them). Imagine telling a bot that you want to submit a receipt on your phone and Azure analyzes your photo automatically, only asking for additional info if the receipt is smudged or the photo quality was bad. Until then, we have something close though! AtBot can be charged with taking your expense submissions using natural language, tossing them into an approval, and letting you know when they’re approved. For free, using Microsoft Flow and Azure Cognitive Services. Two random things that I want to point out because they’re [to me] important, but don’t have a real home above. Why, why, WHY do I have to press Command + Shift + K to insert a hyperlink in Mac’s version of Outlook? It’s stupidly infuriating because every other app on Mac — including every other Office app! — uses Command + K, as they should. It would be one thing if in Windows you had to do Ctrl + Shift + K so there were some consistency within Outlook (though only Outlook). But no: insert hyperlink in Outlook on Windows is — of course — Ctrl + K.
Please stop making me Shift to insert links in Outlook. Pleeeeeease. You know, I was going to go off on a huge rant about how certification options from Microsoft are limited only to technical individuals and how that’s a major problem given their push for the “citizen developer” and spreading digital workplace skills across all users, not just the ones who shuffle server racks. I was going to point out that the SharePoint 2013 Specialist cert is one of the only ones I knew of that was able to be completed by a non-IT Pro, and how even though the Office 365 MCSA is moving to an M365 realm, it’s still going to likely be so much PowerShell that you can’t pass the whole test without PowerShell knowledge. I was going to rant on all that, but then Karuana Gatimu of the Teams product team had to come around and launch what appears to be one of the best non-technical certifications I’ve seen from Microsoft, well, ever: the Microsoft Service Adoption Specialist Online Certification. It’s all about change management and adoption; technically it applies Office 365-wide, though it has a definite Teams bent (which is a good thing). If you’re looking to get certified in something this year, the $99 price point can’t be beaten. You can even take it for free just for the training (no certification credit, of course). So, hats off to the Teams team for quasi-popping my rant bubble on this one. Though the rest of the Office and Power Platform groups could take a lesson from Teams by offering non-technical, power user-level certifications in their apps. So many resumes are just waiting for these to be included, so let’s see them! Things are looking up and I’m eager to see where Satya and team bring us during 2019 on this neverending quest in the Microsoft Cloud. Sure, there are opportunities for improvement as things stand. But that’s always the case. 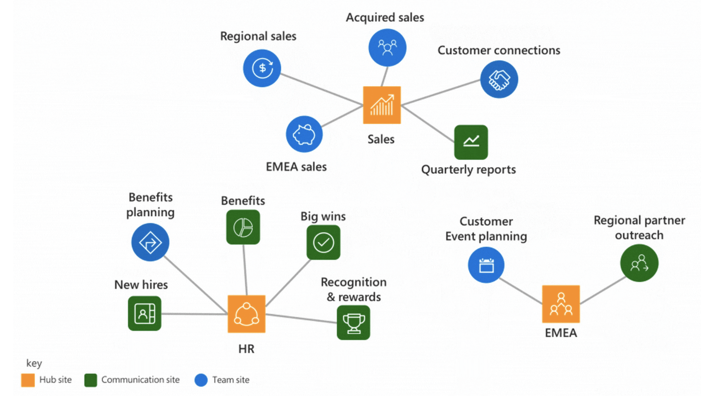 The leaps and bounds of the last few years set up 2019 to be the year of Microsoft 365 success stories that can then become building blocks everyone else can use to bypass the learning curve. And I’m pumped to see where that brings all of us. What are your thoughts? What did I forget or miss? Comment below to start the conversation and I’ll be sure to respond in a timely manner.